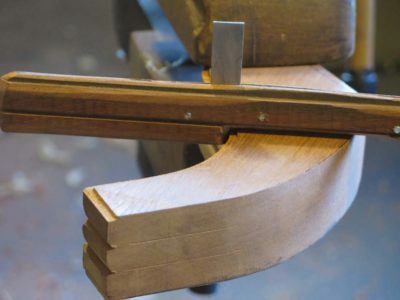 No sooner had I basked in the newest Popular Woodworking article about my shop-made binding clamps then comes the layout PDF from Joshua Klein on my contribution, “A Furniture Conservation Primer” for the second iteration of Mortise & Tenon. It was an honor to be asked, and it obviously comports with my driving professional interests for the past four decades. 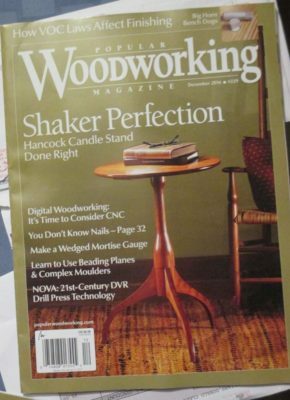 When I got home after some recent extended Thanksgiving travels I found the new Popular Woodworking, in which was this article. It’s always fun to see your work in print. These simple little clamps have become treasured assets in the studio. 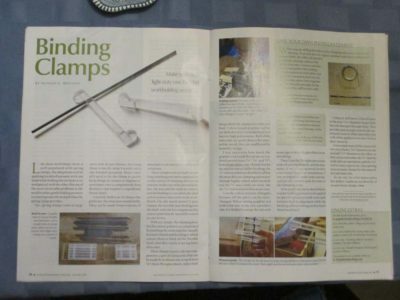 As I finally move forward with a strategy for monthly summer workshops at The Barn it should come as no surprise that they will increasingly reflect my growing interest in toolmaking and hence metal working. 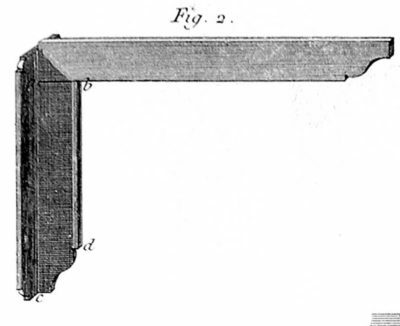 I expect to host at least one toolmaking/metalworking event each summer from now on (2018’s schedule will include dovetail saw making). 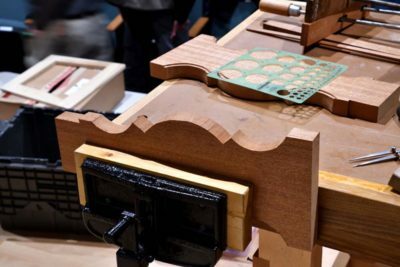 Certainly this will be the case for the gathering of like-minded souls when we try to make a ripple molding cutter next May wherein virtually all of the work will be in metal or HDPA. 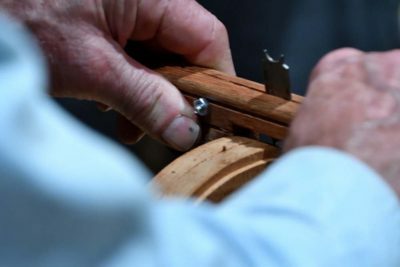 The theme continues with the workshop “Make a Nested Set of Brass Roubo Squares” June 16-18, 2017. Not only are these tools elegantly beautiful, they are particularly functional as the shoe at the base of the beam increases their utility immensely in my experience. Here are two of these style squares I made many years ago. The fact that they can be stood up on the flat or “catch” the edge of something being measured is very appealing to me. The set we will be making in this workshop will be more similar to Roubo’s representation in the engraving above than the ivory or walnut versions in my photo. 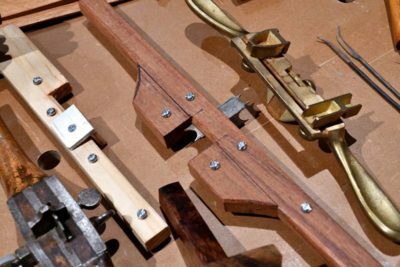 With each student fabricating a set of squares from a 12″ x 8″ piece of brass stock, I expect that we can derive five or six nestled squares. 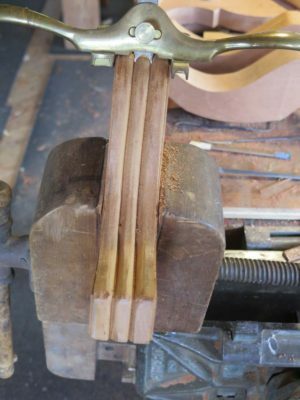 The main point of the workshop will be about sawing and silver soldering of heavy brass stock (.100″ or thereabouts) and in this I will be joined by my long time family friend Lydia Fast who will be showing and demonstrating and teaching silver soldering of the beam to the shoe. 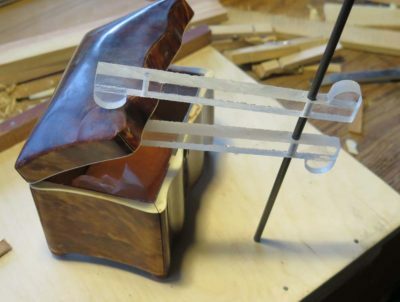 She will be using torches commonly found in the workshop (and local hardware stores) and I will be leading the exercise to fabricate for each of you a fireproof bench-top brazing station which you will take with you at the end of the weekend. The tuition for the workshop will be $400, and I’m working out the materials-and-supplies fee but that will reflect the direct costs of the brass, the silver solder, and the torches (you will take the torches home with you). If this workshop interest you, contact me here. 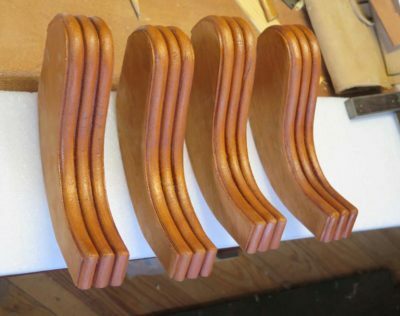 A couple weeks go I was in Elizabeth City NC at the invitation of the Tidewater Chapter of the SAPFM to speak about a current project involving a lot of moldings on the edges of curvilinear profiles. I gave a quick review of the project then set about demonstrating the use of a set of scratch stock profilers I made for the task. Or to put it more correctly, Ben Hobbs demonstrated on my behalf as my hand was extremely tender, weak, and not flexible after six weeks in the cast. I gave it the old college try but was simply unable to complete the tasks. I did not notice making noises while trying, but TomS mentioned that I kept saying under my breath, “Ouch, that hurts.” Thanks for bailing me out Ben. There was a lot of interest in the process, especially once folks saw how simply, relatively easy, and quick it could be. A portion of this presentation will be included in my upcoming banquet lecture at the Williamsburg Working Wood in the 18th Century shindig. PS It is good to be back in blogosphere circulation after travel when I was without internet access for an extended time. I meant to post this last night but we had company and I was engrossed in our conversations. I’ve been voting since 1974, and to the best of my recollection I have never been on the victorious side of voting for anyone or anything, a tradition I expect to continue this year. Except for that time I accidentally forgot which numbskull was the incumbent (are “numbskull” and “incumbent” redundant?) in a school board race and voted for the wrong guy. 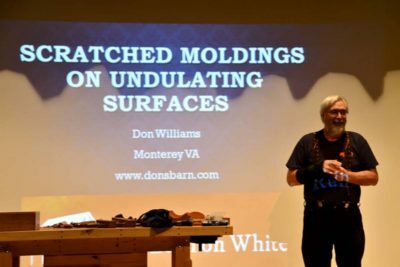 I am excited about the imminent announcement and opening of registration for the 2017 Working Wood Symposium at Colonial Williamsburg this coming February 2-5. Though I have been a frequent attendee, this will be my first stint as a speaker. For the “on stage” portion of the event Be Seated! 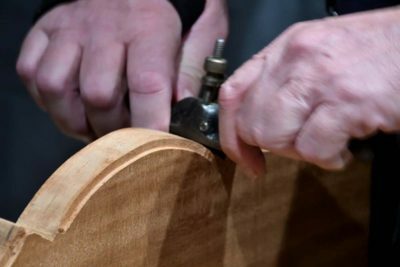 Eighteenth Century Chair Making I will be demonstrating historic pre-industrial finishing. Then I will be the banquet speaker afterwards, addressing the topic of integrating traditional techniques into the modern workshop. 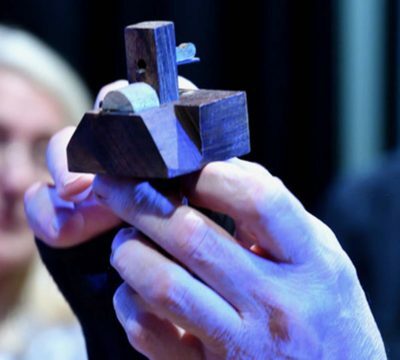 It is always a great time of fellowship and learning, and the conference coincides with the annual business meeting and banquet for the Society of American Period Furniture Makers, where we will recognize the winner of this year’s Cartouche Award Jeffrey Roberts. 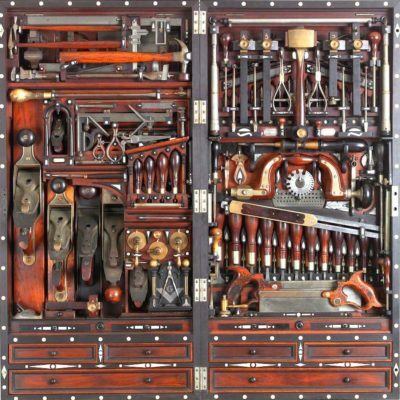 Martin Donnelly just announced the inclusion of a piano-maker’s work bench from the Poole Piano Company (HO Studley’s company) in his April 2017 auction. It’s in Newsletter #180 in case the link changes. I will post more. and a better picture, as I can. Now all I have to do is figure out how to inherit new rich parents so that I can think about bidding on it. On Saturday I will be demonstrating for the Tidewater Chapter of the SAPFM meeting in Elizabeth City NC. I’ll be presenting on the topic of fabricating and using scratch stocks to create complex moldings on undulating surfaces. Actually, even though my cast has been removed I do not yet have the hand and arm strength to do the hands-on, so my friend and SAPFM Cartouche Winner Ben Hobbs will serve as my hands in showing the approach I take. Notwithstanding my adoption of the moniker “lefty” for the past six weeks I have cheerfully fulfilled my previous agreements to make some presentations. 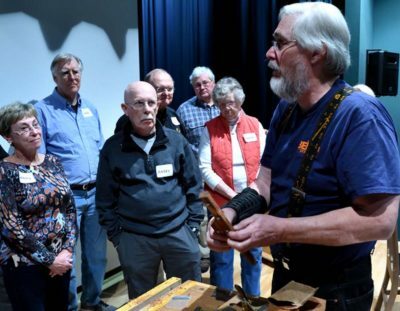 The first was to the DC Chapter of the Piano Technician’s Guild, a national organization whose purpose is to preserve and foster the skills necessary to maintain these almost impossibly complex artifacts. A good piano is not only a thing of visual beauty, it is a thing of aural beauty for the listener and a thing of tactile beauty for the player. This group wanted me to speak, not too surprisingly, about the HO Studley ensemble, a topic I never tire of. The talk must have been a success as I have been invited to give the keynote presentation at The Guild’s national conference next summer. It should be great fun. By the way, I did learn the function of these tools. Others remain a mystery, but I hope to get new insights at the conference. Stay tuned. 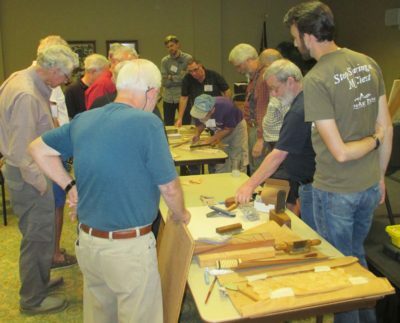 I also continued my longstanding practice of periodically speaking to the Washington Woodworker’s Guild. I think my first talk to them was in 1986. I recruited a volunteer from the audience to serve as my hands for the layout, cutting, and assembly of simple French parquetry. As always, the time was too short so we are discussing a field trip of Guild members to The Barn. Stay tuned about that, too. It was a great relief to get the cast sawn off of my arm yesterday, and the healing is proceeding apace; the bone has fused back together in the correct configuration as expected. That is not to say that the recuperation is anywhere near complete and I will need several more weeks to get back to normal. Since my wrist and hand were locked in place for the past six weeks I’ve temporarily lost about 90-degrees worth of motion in my wrist and hand in every axis; rotation of the hand, flippering of the hand up and down, and moving the hand to the left or to the right. I can rotate my hand/forearm a little bit, but there is almost no motion in the flippering up-and down or side-to-side directions. None of this is unusual, as any of you who have worn an arm/wrist cast can attest. 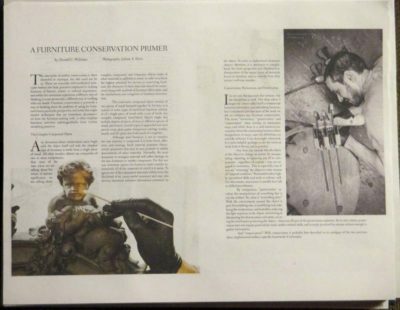 So, my task over the next month is to regain this motion and by extension the dexterity of the hand and fingers. After that comes the recovery of strength necessary to resume with vigor projects in the studio. My next doctor’s appointment is Dec 1, and until then I have a greatly restricted regimen of activities allowed, again focusing on regaining the full range of motion but forbidding any hard pushing or pulling, twisting, jerking, or hammering. In the next month I will be exercising as continuously as possible with flexing the hand in all directions, simply to regain the fine motor skills currently absent — the ability to use a fork with my right hand, brush my teeth with my right hand, and put in my contact lens, button my shirt with my right hand, hold tools, etc. But now I can shower without a trash bag on my arm. Ironically working on the computer suits my hand posture just fine. My hope is that on Dec. 1 I will get the green light to resume activities at the workbench “as you feel comfortable” and my strength regains quickly for my return to projects.